Carolyn and I made the Greek Shrimp again last week. It came out really good this time too. I had a couple of thoughts on how to make it better though. It is probably best to add the parsley at the very in and stir it in off the heat. Most leafy herbs like parsley or cilantro, lose their “green” fresh taste if they are cooked for too long. Cooking for 30 minutes will kills their flavor. Also for a thicker sauce, try uncovering the pan for the last 10 minutes. It still came out great though, give this dish a try! keep em recipes coming!! thank you so much!! 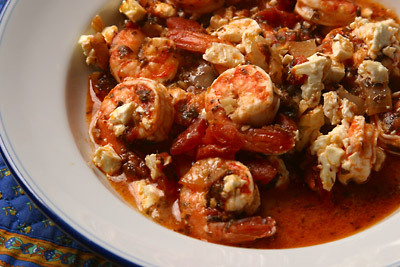 Just made the Greek Style Shrimp – YUM. I served it on a bed of Orzo with crusty bread. Wonderful! This is a keeper. Our big fat greek shrimp dinner was delicious! Thanks for the recipe, Lukolyn!